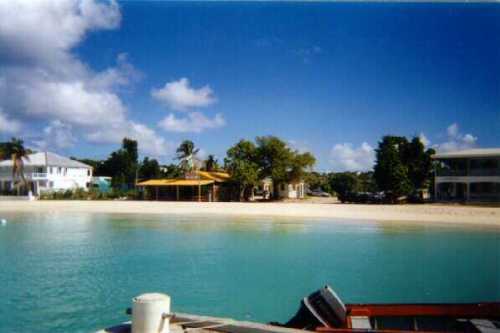 Here is Sandy Ground beach, with Johnnos yellow roof nestled quietly in the trees at the shore. First-time Caribbean visitor Laine Parnell of Vancouver, B.C. Canada can tell you all about it. She has written an enthusiastic and detailed report of her three-week trip to Anguilla, and put it all on a web site. The photo above is just one from her web site, and you have to read her description of "Night Moves" on Sandy Ground to appreciate it. She found fun things to do and uncovered unique places that we had never heard of in our three years on Anguilla. Laine is a single, working woman, grandmother to a 3-year old, and describes herself as having "North American middle-aged hang-ups about a single woman walking into a dance bar alone." In Anguilla she finally felt comfortable enough to shake off her hangups and found that "at no time, with anyone, should an unescorted woman worry about unwanted attention on Anguilla. If you don't want a dance or a chat, a simple 'no thank you' will suffice. You'll be thanked politely for your time and that's it. No problem."